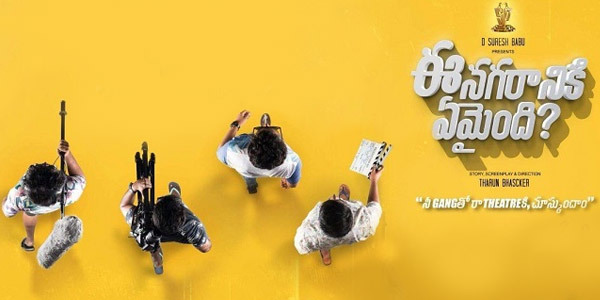 'Ee Nagaraniki Emaindi' has music by Vivek Sagar. Rendered by Cisco Chi, Anurag Kulkarni, Manisha Eerabathini, Hemachandra, Wilson Herald, Suraj Santosh and the music director himself, it has lyrics by four different lyricists. The retro mood of the song is irresistible. That's why the makers have made this number the film's signature song. The prudent deployment of drums and percussion is a treat. Vivek Sagar plays with the guitar and the bass like a pro. Cisco Chi doles out a splendid jazz. The leisurely melody comes with a Rehmanesque hangover for sure. Anurag Kulkarni's soothing vocals have a match in Manisha Eerabathini's. Unlike in most other songs of the album, the lyrics of this melody are easily decipherable. Krishna Kanth's meaning-laden lyrics match the musical complexity of the number. It's like a liberation song, much as the title suggests. The snazzy feel sits well with Hemachandra’s dazzling vocals. The clever use of the drums and the saxophone bears a testimony to Vivek Sagar's knack. Kittu Vissapragada is proving to be a highly competent dialogue-writer as well as a lyricist who can pen simple but meaningful lines. The retro-style song once again comes with a lazy feel. And it's meant to be that way. Wilson Herald's voice doesn't overpower the music while still making a strong impact. Once again, Kittu Vissapragada’s lyrics sound very natural. There is no sense of forced themes. Special mention for Pranav Chaganty's rap. This song follows an old-fashioned trajectory fashioned by quite a few Kollywood music directors in the 1990s. Vivek Sagar doubles up as the singer for this number. Vivek Aatreya's thoughtful lyrics drive the song's emotions in a unique way. The electric guitar delivers a certain rhythm. Vivek Sagar dares to care out his own path without falling back on the low-hanging fruit. Sooraj Santhosh's modish voice goes well with the overall mood of the album. The lyrics are a big draw by, once again, Vivek Aatreya. The album presents a heady mix of songs. The music style is unconventional. If you are looking for songs in a familiar territory, you have them, too.